By extracting and studying the DNA of ancient skeletal remains — some as old as 11,000 years — an international team of researchers has uncovered significant evidence of genetic exchanges between ancient populations in North and South America, shedding light on how South America was populated. These findings have broad implications about who the first Americans were and where and how they migrated. The conclusions indicate that, thousands of years ago, waves of North American populations traveled south, resulting in major population turnover in regions throughout South America. It is believed the settlement of the Americas began around 13,000 to 15,000 years ago, when humans first crossed from Asia to North America via a land bridge connecting northeastern Siberia to western Alaska. From that migration, the Clovis culture — the first widespread culture of North America — materialized. Using new DNA sequencing technology, Hubbe’s team determined that the skeletal remains of an individual associated with the Clovis culture dating around 12,800 years ago share clear genetic ancestry with the oldest remains collected in South America. Previously, studies using cranial morphology, a method in which the form of skull structures are analyzed, had identified common traits between Clovis culture individuals and South Americans. The researchers’ findings confirm formerly held hypotheses regarding population movement between North and South America. 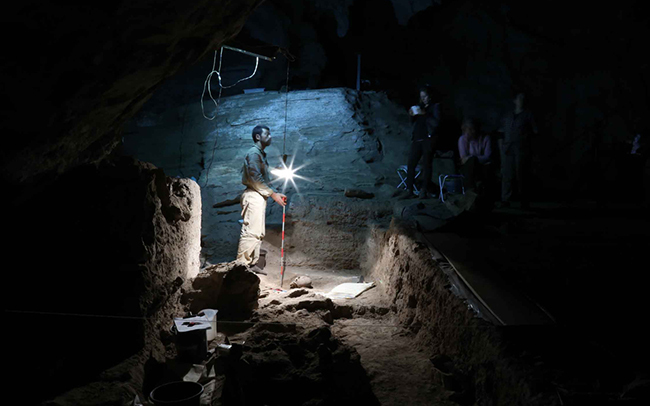 Excavation at the rock shelter site of Lapa do Santo in Brazil, where the human skeletal remains dating back approximately 9,600 years were found. “This DNA information compliments a series of studies we’ve been doing with the skeletons to show that there’s a lot of diversity — there’s a lot of movement that’s happening in the Americas,” said Hubbe, who has studied skeletal collections of Lagoa Santa, in southcentral Brazil, that represent one of the oldest groups known from South America. Curiously, this link between South America and the North American Clovis culture disappears in later South Americans, indicating a continent-wide population replacement that occurred around 9,000 years ago. “Ultimately, when we if we look at the human biological diversity over time in South America, we see a very complex history — one migration comes in, founds Lagoa Santa, and then is later replaced by another migration from North America.” Hubbe said. The study provides a glimpse of what further research using the same DNA extraction technique can discover, and Hubbe looks forward to unearthing more answers.